Tectonics. Tectonics. It’s a word that you can really roll around in your mouth, like a tic-tac. Or a tim-tam. Or a tick-tock. Okay, maybe not that last one. Tec-ton-ics. Aside from its phonophiliac qualities the study of plate tectonics and the Earth’s interior is very interesting from a planetary science point of view, because the Earth has some internal qualities that are – as far as we know – unique amongst the discovered planets. A hundred years ago plate tectonics wasn’t even a thing. People thought the Earth was basically this boring lump of rock that had been slowly cooling and shrinking ever since it formed, with mountains and other irregular features being explained away as the surface crumpling and wrinkling kind of like the skin of an old apple. This cooling process gave the Earth a predicted age of only a few million years, since it was assumed that the Earth had been losing heat via black body radiation ever since it had formed and there weren’t any other known sources of heat within the Earth that could mitigate this in any significant way. The discovery of radioactivity in the late 19th century provided the impetus for a slow reassessment of this theory. Radioactive elements produce heat as a byproduct of their decay, meaning that not only could the Earth be much older than previously thought, but that the interior of the Earth might be hot enough to be liquid or semi-liquid allowing new theories about its internal structure and geological processes to be formulated. However, it wasn’t until the 1960s that irrefutable evidence was found for the modern tectonic plate model of the Earth’s crust via a phenomenon called seafloor spreading. What is seafloor spreading? Well, say you have an area in the middle of the seabed where two tectonic plates are slowly moving apart. 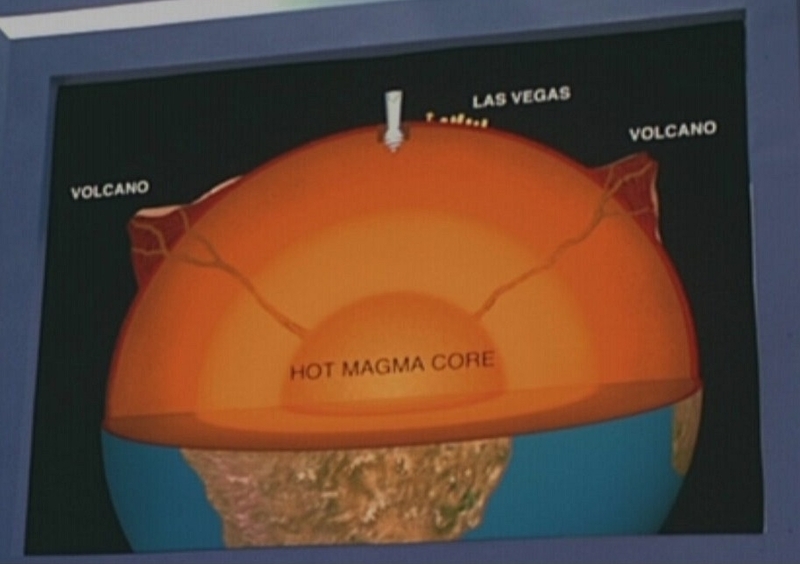 Mantle material – in the form of LIQUID HOT MAGMA — will gush up from deeper inside the Earth to plug the gap, which cools and solidifies when it reaches the surface to become part of each tectonic plate. Meanwhile the other side of the tectonic plate is banging up against yet another plate, and is likely being subducted – that is, driven underneath that plate to become part of the mantle. This results in a sort of “conveyor belt” system where the two plates are constantly moving apart, but new material is being added to each plate at the boundary separating the two. 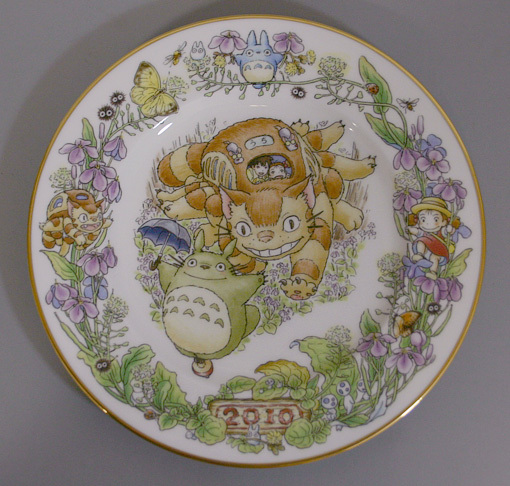 However this still might have been dismissed as an isolated or recent phenomenon had it not been for analysis of the magnetic striping of each side of the plate. 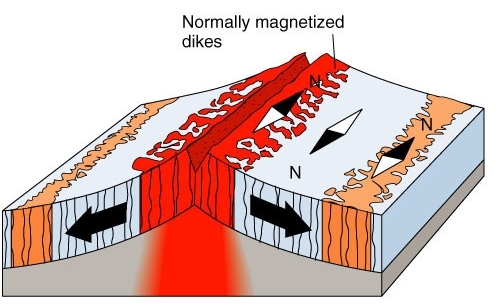 As newly formed rock cools – such as the rock created by the upwelling of magma in the centre of the plate boundary – magnetic materials in that rock like magnetite record the current state of the Earth’s magnetic field. The polarity of the Earth’s magnetic field is known to periodically reverse itself every million years or so due to the rotating liquid iron outer core that creates the field not rotating entirely uniformly and introducing gradual irregularities into the field until it “flips” (this is sort of the same process that creates sunspots, except not really). These reversals are therefore encoded into the rock that makes up the surface of the tectonic plate as it forms, creating a “striping” effect as the rock of one polarity is gradually carried away from the plate boundary to be replaced by newly formed rock of a different polarity. 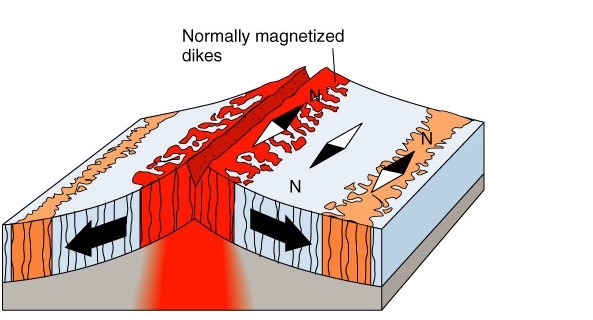 When scientists looked at the magnetic patterns of the rock on each side of a plate boundary they discovered that not only did the polarity of each set of magnetic stripes on either side of the boundary match almost perfectly, but that the age of the stripes got younger as they examined rock closer to the boundary area. 1) New rock was being created from mantle material (as shown by the stripes’ age and polarity shifts). 2) This new rock – and by extension, all the other rock on the plate in question — was then transported away from the plate boundary by continental drift (as shown by the matching magnetic stripes). That continental drift also neatly explained the discovery of similar fossils on different continents as well as the question of how the same species of animal could exist on either side of an ocean without crossing it was merely the icing on the cake. Today we know that the surface (or crust) of the Earth is composed of seven primary tectonic plates that very roughly correspond to each of the seven continents along with a whole bunch of subsidiary plates. These plates vary in thickness from 30 – 50 km underneath the continents themselves to just 5-10 km thick underneath the oceans. Oceanic crust is constantly being created and destroyed by seafloor spreading and subduction beneath other plates, and so it is rarely more than 200 million years old. By contrast the rock making up the continental crust is persistent, with ages of up to 3.5 billion years being measured. So you’ve got these enormous tectonic plates and this continental drift theory. All well and good, but then you run into the tiny problem of having to come up with a mechanism capable of causing the gradual movement of trillions of tons of rock over billion year timescales. Happily such a mechanism does exist: the plates are “floating” (see isostasy for a completely incomprehensible explanation) on top of a vast sea of very hot, highly viscous rock called the mantle. This mantle stretches from the Mohorovičić discontinuity layer1 separating it from the crust all the way down to the liquid iron outer core of the Earth 2900 km beneath it. Since the mantle isn’t strictly solid it’s possible for internal convection currents to cause it to constantly shift, and the continental plates shift along with it. 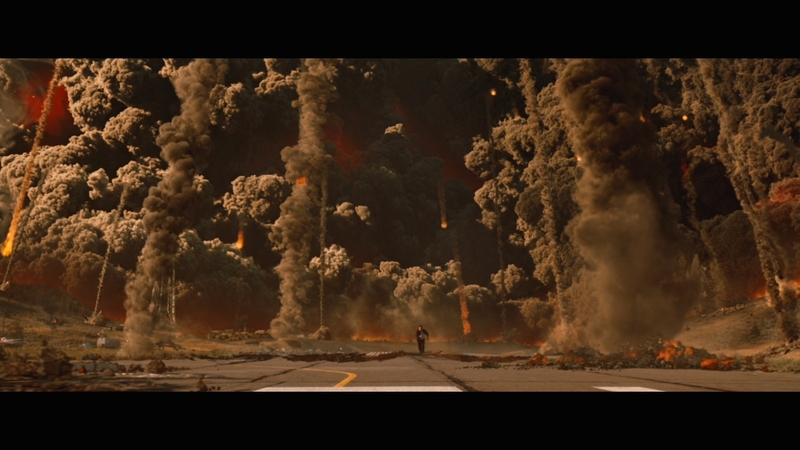 The existence of the mantle can be easily inferred both from simple physics — as you go deeper into the earth the pressure and therefore the temperature of the rock making it up is going to rise in a fairly predictable manner, allowing scientists to make decent estimate of what it’d be like down there — and seafloor spreading, since that magma has to come from somewhere. I should make sure to stress at this point that the mantle isn’t liquid hot magma. It’s hot, sure, but because the pressure of all the material above it pressing down on top of it is so immense it cannot liquefy and remains a solid, albeit a highly viscous one. This means that while the mantle does flow it does it over geological time scales of millions of years – much like a glacier, although it’s different in almost every conceivable way. And if you were to provide the mantle with some way of relieving the pressure – say, by punching a vent to the surface through the seabed as at mid-ocean ridges – the mantle rock would undergo what is called decompression melting; now that the pressure of the rock above it is gone there’s nothing keeping it from melting into magma. Scientists have made a series of amusingly misguided attempts to retrieve material directly from the mantle. Most famous of these was the Mohole, which took the startlingly bone-headed approach of trying to drill down through the thinner ocean crust to get at the mantle. This makes sense in theory, as you’re skipping the tedious job of drilling through forty to fifty additional kilometres of rock you’d have to deal with if you did it on top of continental crust, but you’re merely replacing that little problem with the bigger one of trying to drill a hole at the bottom of 3.5 kilometres of ocean from an untethered surface ship. Needless to say it did not end well, and the project was cancelled after the costs started to spiral. The Soviets made a similar attempt and went about it in a typically Soviet way: they chose to drill their hole through 35 km thick Siberian continental crust but they kept up the drilling program for twenty-two years, eventually reaching the fairly respectable depth of 12.5 km before temperature difficulties (not to mention the collapse of the Soviet Union) stopped the project. This is the deepest hole anyone has ever managed to dig, and it was still barely a third of the way down. With that in mind, if we haven’t even managed to reach the mantle yet then how on earth do we know how far down it goes and what is beneath it? For that matter, how do we even know how the mantle is structured? (And it is structured, being divided into a more plastic upper mantle which is under relatively little pressure, and a more rigid lower mantle which has less opportunity to flow because it’s compressed so much by all the stuff above it.) The short answer is: earthquakes. By tracking earthquakes and analysing how earthquake shockwaves travel through the Earth (or not), scientists can figure out what exactly is down there. Earthquakes produce two main types of waves, P-waves and S-waves. P-waves move along the direction of propagation while the motion of S-waves is transverse to it; this is an excellent demonstration of the difference that’ll save me about five hundred words of explanation. The difference between P-waves and S-waves is crucial, because it’s this difference in the direction of motion that dictates how fast they travel and what they can travel through. P-waves can travel through anything, and they do it quickly. S-waves cannot travel through liquids because liquids cannot sustain the shearing up-and-down motion through which S-waves propagate2, and they move slowly in comparison to S-waves. Taken together these differences allow us to build a fairly good map of the interior of the Earth if we track them after an earthquake. Here’s how the two types of waves propagate through the Earth (not stolen from Wikipedia for once, either). They follow curved paths because the material they move through refracts them, and this refraction increases as the density and pressure of that material increases with depth. The P- and S-waves also undergo sharp refractions whenever they encounter a material shift as with the Mohorovičić discontinuity or the boundary between core and mantle. 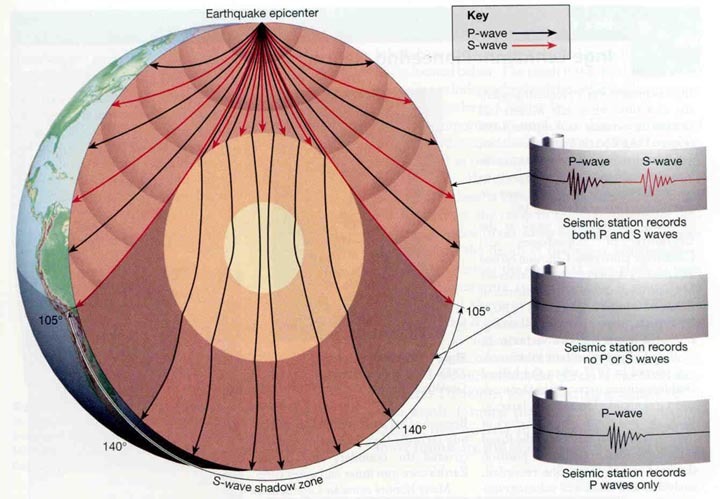 As you can see the liquid outer core of the Earth effectively stops all S-waves, neatly proving that it is a liquid (other proofs include the magnetic field of the Earth being exactly what we’d expect to see if you had a rotating convecting layer of liquid iron somewhere down there). Sharp changes in the trajectories of the P-waves meanwhile provide compelling evidence for a second boundary between the liquid iron core and an interior area which is different — presumably a solid iron core. Finally the speeds of the two types of wave allow inferences about the composition of the material they are moving through to be made, since this is directly dependent on the density and elasticity of that material. 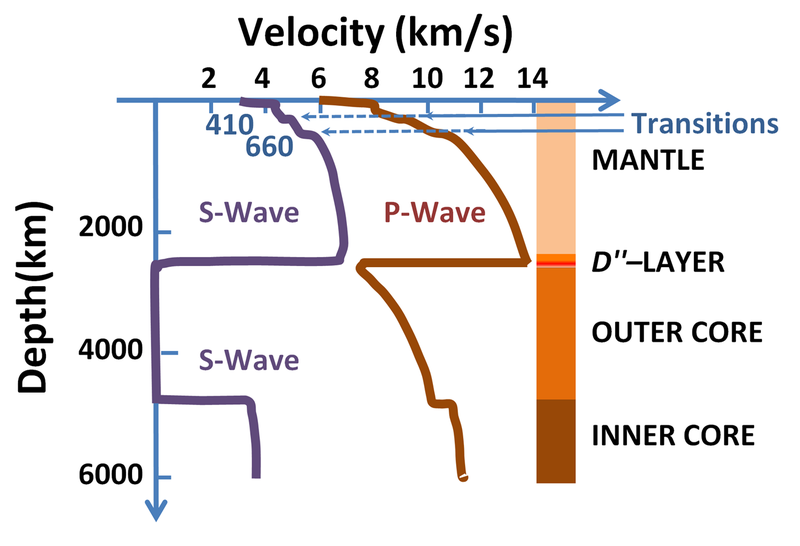 So from earthquake waves we know that the mantle is divided into a more elastic upper layer and a more rigid lower layer, that there is a liquid iron core that stops S-waves, and that there is a solid iron core inside that which alters the path of P-waves. While the other planets are certain to have mantles and iron cores thanks to the way planets form and differentiate over time, we are aware of none which have the liquid iron core that drives most of the active geological processes on Earth – no large-scale radioactive decay releasing heat into the mantle driving convection and plate tectonics, and no magnetic field protecting the surface from harmful cosmic radiation and the solar wind. This is why you’ll hear me throw around the term “geologically dead” quite a lot when describing the other terrestrial planets; they aren’t entirely so thanks to constant low-level radioactive decay and we can see that they weren’t always so from the presence of long-dead volcanoes, but in comparison to the Earth today they’re pretty much geologically inert. Foof. That was a bit of a random topic, but I felt it was useful to get it out of the way because it’ll be good background should I ever get around to talking planetary physics. Next week I’ll be talking about orbital resonances and how they’ve sculpted the structure of the Solar System. Or more accurately, simply trying to describe what an orbital resonance is without coming across as a gibbering lunatic. Until then, KEEP WATCHING THE SKIS. 2. To use a really bad analogy: this is for the same reason that you cannot walk on – or more accurately through — water; the water will simply deform underneath you and you will sink. Similarly water (or any other low-viscosity fluid) will simply deform under the shear stresses created by S-waves rather than propagating them further, causing them to be lost in a very short space of time. I should also probably note that S-waves are different from the surface waves you might see out on the ocean as they move through the main body of an object rather than along the top. Will you at some point cover what surface effects this apparently unique feature has? I think I’ve very briefly and partially covered some of them in other posts, but it might be useful to do a roundup at some point. I’ll put it on the list. I love the phrase “continental drift”. Bits of wood ‘drift’. Leaves ‘drift’. If there’s one word to totally miss the power of the plates colliding it’s ‘drift’. “Continental NASCAR” was vetoed by the International Geological Union because it was “too redneck”.